You can begin your seafaring travels from the glorious coast of the Mediterranean of Turkey, or place your compass in the direction of the culturally colorful Turkish Aegean. Wherever it is that you choose to embark on your Turkish sailing cruises, be assured that your journey will include heavenly places and smiling faces. 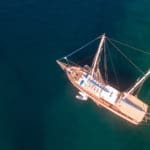 The pure pleasure of sailing holidays from Turkey can be experienced in its own unique style on board a elegantly handcrafted Turkish wooden boat. These fine boats represent part of the historical background of Turkey from the Mediterranean shores all the way to the tip of the southern Aegean. What makes it all the more alluring are destinations that Turkish gulets travel to. To begin to even think about where to visit, what to see and taste, is probably the most difficult part in the decision making if you have never been to Turkey before. But, like the locals (who share their smiling faces) in these parts, all you do is just relax, bring an open mind as well as an easy going attitude and you’ll be fine. 🙂 The warm hospitality found in the Turkish culture is present just about everywhere you visit during your blue cruise holiday. The quaint seaside villages, charming little towns, and the major harbor cities offer such life and color that you might not always see everyday in the western world. There are so many heavenly places along the impressive coastline, that to even begin to describe them all would be a never ending story. Therefore starting from the most popular embarkation points for Turkish gulet cruises; we have in the Aegean, close neighbors with the incredible Greek Islands, is the ever so vibrant city of Bodrum. The Milas airport is a short 40 minute drive to the harbor. The city has everything one can expect from a tourism hotspot. From Bodrum you can quite easily sail to the Greek Islands in the Dodecanese, Cyclades all the way to Athens. Alternatively the Gulf of Gokova is a superb yacht holiday itinerary as well full of the charming villages and towns mentioned above. 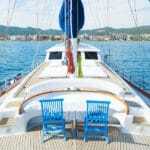 With a Bodrum blue cruise, the choice in gulet itineraries are plentiful! Located right on the border between the Aegean and Mediterranean seas is the lively harbor city of Marmaris. One of the most distinguishing feature of Marmaris is that all the shopping, dining, waterfront pleasures, night clubs and marinas are situated parallel – as well, where you embark on your Marmaris blue cruise holiday. As for sailing routes, due to its location, you can combine your gulet holidays to include only the Mediterranean heading east to visit some of the most popular ancient cities such as Simena and Caunos. In the opposite direction steering west your itinerary can take you as far as Bodrum in Turkey and Athens in Greece; while stopping in the Dodecanese islands of Rhodes, Symi and/or Kos and further, passing by the Cyclades. If your interest solely lies in just the Mediterranean of Turkey; you again have much to choose for your exploration. Two other main ports that serve blue cruise holidays is the delightful little town of Gocek and the busy harbor city of Fethiye. 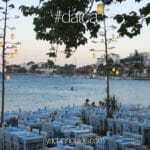 Both are quite near to the Dalaman airport – where Gocek is a 20 minute drive and Fethiye is only 40 minutes away. Turkey is a destination utopia. 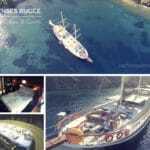 What better way to enjoy it all than with a gulet cruise for your next holidays overseas!